Grab your hiking boots because the Ain is a rambler's paradise! The terrain is incredibly diverse with flat marshland giving way to high mountains and fertile agricultural plains. All types of sport are readily available - from the extreme, such as sky diving, to the relaxing, such as golf. The department, located in the north of the Rhône-Alps, was created in 1790 out of land originally belonging to Burgundy. The north-eastern tip of the Ain forms part of the French/Swiss border. Bourg-en-Bresse is the capital of Ain, located 32km east of Mâcon. If you happen to be eating chicken in a French restaurant or overtaking a lorry on one of the country's roads then there's a chance that they both came from this town. Chickens far outnumber humans on the flat plains that surround the town while Peugeot make their lorries here. The village of Brou, in the suburbs of Bourg-en-Bresse has made a name for itself owing to its early 16th century chapel. The chapel was commissioned by Margaret of Austria and intended as a mausoleum for herself and her husband. 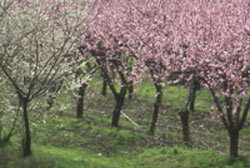 The west of the department is the place to be if you want to try the produce from the local vineyards. 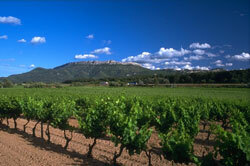 The border with the Rhône department is marked by acres of vines, planted around small picturesque villages. Amongst the best villages to seek out are Chiroubles, Fleurie and Julienas. Although Ain doesn't have an airport, there are many within easy reach. Depending on where in Ain you need to get to, the closest options are Lyon, Geneva, Chambery and Grenoble. And apart from British Airways and Air France, there are a whole host of budget airlines flying to the Alps, so you can take your pick. If taking to the skies is not for you then there is an easy alternative. The TGV service will take you all the way to Lyon or Grenoble from the Channel Tunnel (changing at Paris) in comfort and speed. Property prices rise the closer you get to the larger towns. The west of the department is ideally positioned between Mâcon and Lyon, while the very east borders Geneva. Do you know Ain better than we do? Do you have photos of Ain? At the extreme north of the Rhone Alps region, bordering Rhone and Haute Savoie.